Amsterdam distinguishes itself by its rich, versatile and free character. In the bustling heart of this fascinating melting pot of various lifestyles, customs, traditions and heritage, the new Andaz Amsterdam Prinsengracht hotel has opened its doors. Marvelously set on the Prinsengracht - Prince's Canal - part of the city's iconic ring of canals, the 122-room hotel is surrounded by the unique cultural scene and spirit of the lively Jordaan district and adjacent “Nine Streets”. Offering not merely a place to come home and relax, but a place that will energise and inspire you. Welcome to your Andaz. The Andaz experience begins the moment you arrive through the doors of our hotel and discover the world behind the façade of the former Public Library on the Prinsengracht. Here you will be greeted by one of our Andaz hosts and invited to have a drink in the lounge while checking in via a computerized tablet, or simply en-route to your artistically inspired, stylish hotel room. Arrival is at your pace, in your style. Reflecting its energetic and distinctive surroundings, the unique flavours of Amsterdam are embedded in the walls of Andaz Amsterdam Prinsengracht, making the journey to this city more than simply a visit. It will be your personalised experience, enabling you to arrive as a tourist and leave as a local. 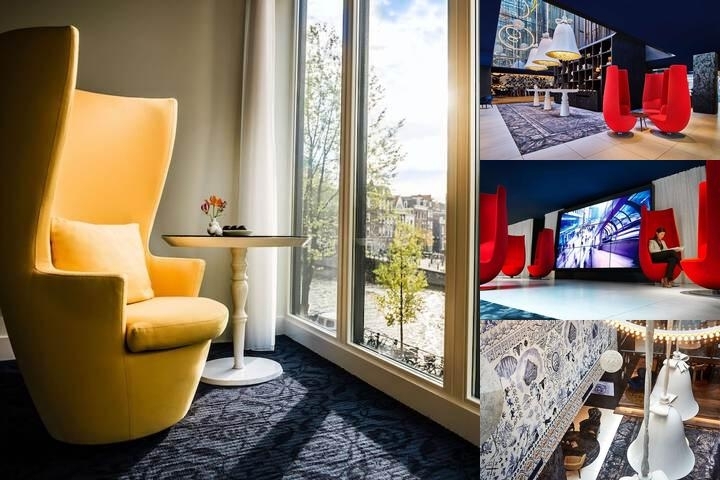 Explore the various sights, sounds and tastes of Amsterdam through the adventurous design of our hotel, brought to life through the vision of local architect and designer Marcel Wanders. Reflecting a modern view of Dutch history and local culture, you will delve into a piece of Amsterdam wherever you turn, whether it is the video art on the walls, the books on the shelves, or the food in the restaurant. And if you really want to go the “local” way, why not jump on one of our bikes to get around? True to the brand, Andaz Amsterdam Prinsengracht combines a contemporary and personal approach with attentive and uncomplicated service. A stay at our hotel is not complete without the unique Andaz amenities, such as the complimentary non-alcoholic drinks and snacks from the mini bar, local calls and wireless Internet. Enjoy the social heart of the hotel and relax with a cup of coffee or glass of wine in the Andaz Lounge or experience an exciting culinary evening in our in-house restaurant Bluespoon where Chef Julien Piguets' cuisine comes to life with only the finest and freshest local products. If it is relaxation that you desire, make your way to our spa with sauna and treatment rooms complemented by a fully equipped gym. For business and social events, Andaz Amsterdam Prinsengracht offers 400 square metres (4,305 square feet) of meeting space comprised of three boardrooms and the Andaz Studio, catering to everything from a formal boardroom meeting to an intuitive cocktail reception. The dynamic Andaz Studio meeting space is designed to engage and energise guests as if you were entertaining them in your own home. All meeting rooms are equipped with the latest technology and are ideally suited for presentations, exhibitions, fashion shows and cultural events. Dogs and cats only. 45.00 EUR fee is per stay. Below are the meeting, banquet, conference and event spaces at Andaz Amsterdam Prinsengracht a Concept by Hyatt. Feel free to use the Andaz Amsterdam Prinsengracht a Concept by Hyatt meeting space capacities chart below to help in your event planning. Hotel Planner specializes in Amsterdam event planning for sleeping rooms and meeting space for corporate events, weddings, parties, conventions, negotiated rates and trade shows. Andaz Studio’s The Andaz Studios are located on the ground floor of the Keizersgracht building and are accessible via the hotel’s main entrance, passing through the garden. Studio 1 Studio 1 is a dynamic meeting space designed to engage and energize guests as if you were entertaining them in your own home. This studio is the largest and most versatile of our meeting rooms. In its vibrant and inspiring setting facing the landscaped garden, Studio 1 seats up to 150 using the posh space of the Gallery. For conferences and presentations, this space can also provide your clients and colleagues with a relaxing area for morning coffee or lunch. This meeting room comes equipped with top-of-the-line audiovisual equipment and is ideally suited for presentations, exhibitions, dinners, fashion shows and cultural events. Studio 1 may be combined with the Gallery as a private catering location. Also, complimentary wireless Internet, a built-in coffee maker, refrigerator and storage spaces are facilitated in each room. This studio has air-conditioning/air-cooling and natural daylight. 19 x 8 x 2 M.